GMA Network’s socio-civic arm, GMA Kapuso Foundation (GMAKF), receives a Silver Anvil Award at the 54th Anvil Awards. 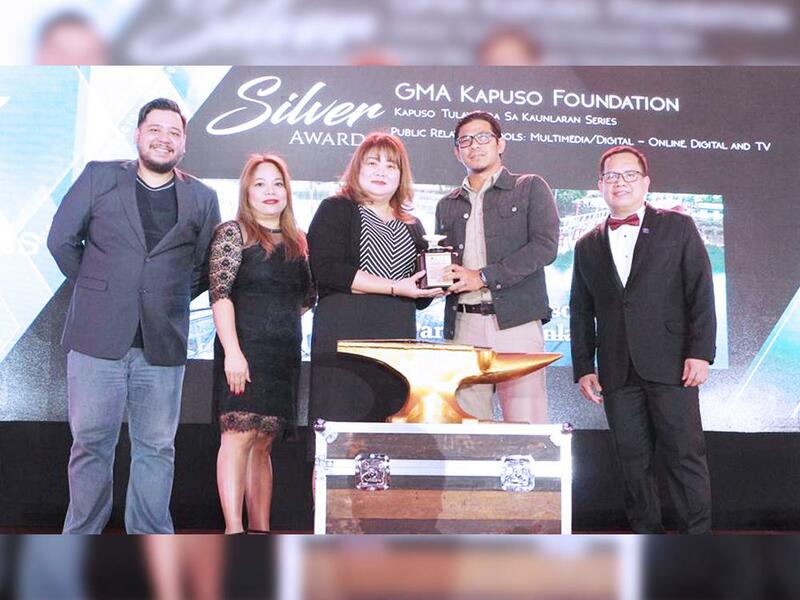 GMA Network’s socio-civic arm, GMA Kapuso Foundation (GMAKF), received a Silver Anvil Award at the 54th Anvil Awards held on January 30 in Pasay City. (L-R) PRSP Secretary Mikey S. de Quiros, PRSP Director Ana Pista, GMAKF EVP and COO Rikki Escudero-Catibog, GMAKF Senior Project Engineer Edgar Eniego, and PRSP Vice President-Internal and 54th Anvil Awards Chairman Andy B. Saracho. GMAKF’s, “Kapuso Tulay para sa Kaunlaran” series which aired on the Kapusong Totoo segment of GMA’s primetime newscast 24 Oras, was awarded a silver Anvil under the Public Relations Tools – Multimedia/Digital category. Through the project, two typhoon-damaged hanging bridges in Buhi, Camarines Sur were replaced with sturdy steel and concrete bridges, providing a safe passageway for local children to get to school and for residents to have easier access to the highway going to Iriga City. The Silver Anvil was received by GMAKF Executive Vice President and COO Rikki Escudero-Catibog together with GMAKF Senior Project Engineer Edgar Eniego. Escudero-Catibog expressed the foundation’s heartfelt appreciation for the recognition. “First, we offer everything to God. We wouldn't have been able to do this without his guidance and inspiration. Tita Mel [Tiangco] dreamed of building bridges and this came into fruition in 2017 and 2018 with the two Kapuso bridges in Buhi, Camarines Sur. Natutuwa kami na talagang pinahalagahan ng Anvil Awards yung mga ginawa naming segments about the bridge, its inception, its construction, and its turnover to the community,” Escudero-Catibog said. Conferred by the Public Relations Society of the Philippines, the Anvil Awards honors the most outstanding public relations programs, tools, and practitioners in the country.